Who was George Ellery Hale? What contributions did he make to astronomy? Read on to learn more about George Ellery Hale. Sometimes young children know what they want to do when they grow up. Parents often dismiss their desires as childhood whims and children often change their minds. However, the parents of George Ellery Hale did not dismiss his interest in space. In fact, they helped him follow his passion and bought him the tools he needed to study the stars. Their attention to their son’s interest paid off. Not only did Hale become an astronomer, he made some amazing discoveries about the sun during his career. As a young boy, George Ellery Hale had a passion for the stars. When George Ellery Hale was 14 years old, he asked his father to buy him a telescope. He had already possessed a microscope and began to understand optics. A little while later he built his own telescope. His desired to watch the rare event of Venus passing between Earth and the Sun. After graduating high school Hale decided to broaden his knowledge in astronomy and physics. At seventeen, he enrolled in the Massachusettes Institute of Technology. To further encourage him, his parents built him his own laboratory, a brick building on their property. During his undergraduate years at the university, Hale developed a special tool to study the sun called a spectroheliograph. The spectroheliograph is an instrument used in astronomy which captures a photographic image of the Sun at a single wavelength of light, a monochromatic image. The wavelength is usually chosen to coincide with a spectral wavelength of one of the chemical elements present in the Sun. The spectroheliograph launched the design of telescopes dedicated to solar astronomy. After he graduated, he discovered that the Sun tends to have an east-west alignment of magnetic polarities in sunspots. Hale also noted that the polarity in each hemisphere switched orientation from one sunspot cycle to the next. Astrophysicists commonly refer to the principal of sunspot magnetic fields as “Hale’s Law”. One of the most significant contributions was the construction of four astronomical laboratories. 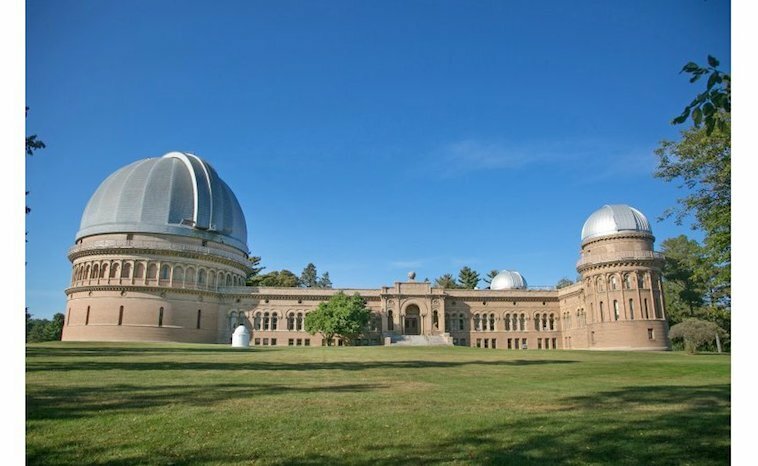 Yerkes Observatory opened in 1897. Slated to close October 2018. 40-inch refracting telescope. Hale not only contributed to astronomy by building four of the world’s largest telescopes, he also started the Astrophysical Journal. His peers called him the first astrophysicist. He played a major role in changing the Throop Polytechnic Institute into the California Institute of Technology and had an amazing ability to raise funds for his various observatories. At one point Albert Einstein wrote to him about a hypothesis concerning the effects of gravity on light. He replied that Einstein would need an eclipse of the sun to test that hypothesis.Although Hale raised the funds to have the telescope built, he would not live to see that the Palomar Observatory telescope reach completion. Furthermore, we give credit to George Ellery Hale’s parents for encouraging him at a young age. With their dedication, the world of astronomy has benefited from the great mind of George Ellery Hale. Life on Mars: Fact or Fiction?